The Milestones Checklist can be edited to include more milestones. Milestones are significant points in the project when the client should sign off accepting the work done to that point before you move on. You can also design your payment terms around accepted milestones. This can prevent costly mistakes from being made if you develop the entire project without the client's involvement along the way. an incredible source to save you time and money when a strong proposal for work is needed. I am an owner of a nonprofit training company and have other trainers who work for me and they love these templates that can be easily adapted. Why reinvent the wheel?." This Contract Milestones Checklist is included in editable Word format that can be customized in Word or by using the included Wizard software. Sample Milestones for a typical project. Edit as you see fit for your own project milestones. This document is intended to be attached to the development contract with Exhibit A (Payment Terms) and/or Exhibit B (Project Specifications). 1 Acceptance of project mockup graphics. 2 Acceptance of project skeleton architecture/design. 3 Acceptance of navigation interface, prototype, project alpha. 4+ Each 40 hours of logged work is billed as a milestone, each beta release, etc. Final Final acceptance of project. 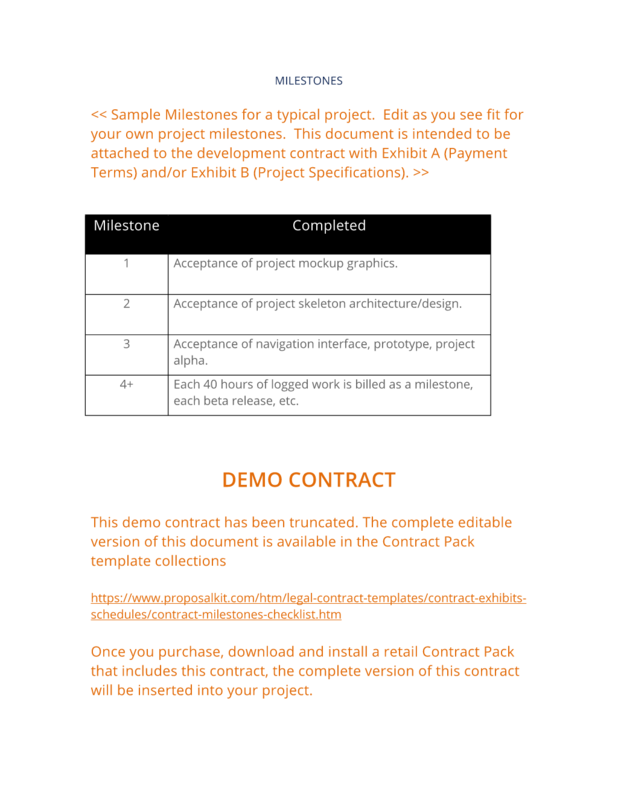 The complete Contract Milestones Checklist - with the actual formatting and layout - is available in this Contract Pack.